UNISON members who are careworkers for the outsourced Barnet care company Your Choice Barnet (YCB) will take further strike action this week in protest at the harsh 9.5% pay cut imposed on them by their employer. The strike dates are 24 and 25 February. This takes place in the middle of the TUC Fair Pay fortnight. This will make a total of eight days of strike action since the dispute began. 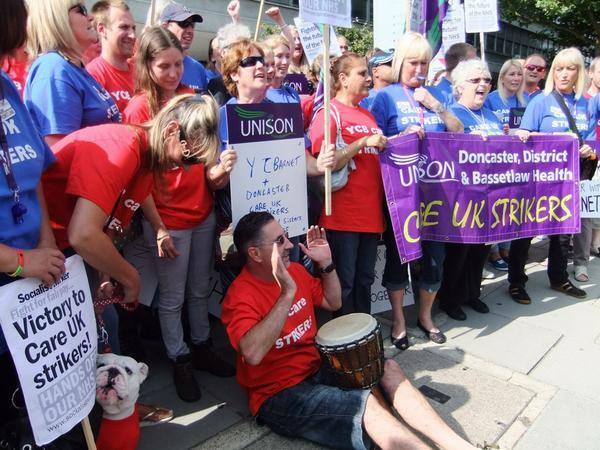 YCB has not met with UNISON as they have indicated they have nothing new to offer. Barnet Council has failed to become involved in a positive way at all. The Council has clearly been giving preferential treatment to its private contractors with the news of Capita has already received £110 million in the first 16 months of the two contracts. If YCB were to receive this, it would carry on producing a service to the residents on the scale it does for the next 18 years with no pay cut to staff! This dispute is clearly one of priorities. See Barnet Unison for more details.